Disclaimer: This wasn't the original "stepped up" card I had planned, but I wanted to show you that it is VERY common to have an idea and end up going a completely different way with it, and it STILL works out! Sometimes you have to let go and let the card muse take over. You may even surprise yourself! So here's the stepped up version. And yes, I got a little carried away, so you will notice stripes instead of a solid Cherry Cobbler card base. I also added those ADORABLE mini jingle bells (that really jingle!) But the main idea I had for "stepping up" this card remained the same, and that was turning it into a shaker card! 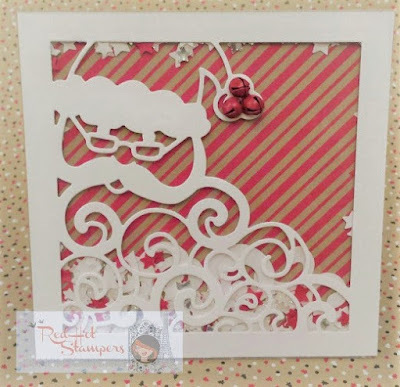 Rather than add the Detailed Santa directly onto the card base, I stuck him on a window sheet and then bumped him up with foam adhesive strips which gave room for all those stars! Gotta love a shaker card! You can add sequins instead of the confetti, but I always love the option with the Confetti Stars (or Hearts!) Border Punch! I punched Whisper White, Real Red (to match the stripes!) silver foil and dazzling diamonds glimmer paper stars! I left a couple of the leftover curly-Q's from his beard in there too. I wouldn't add too many though or all the stars will get stuck in one place.